Leonardo da Vinci’s Virgin of the Rocks is the artist’s most important surviving work, for its large size, for its good condition, and for the power of its artistic effect. It is one of the few paintings Leonardo completed, and it is entirely by the artist’s hand. It was executed while he was in Milan, shortly after his arrival from Florence. Recently discovered documents indicate Leonardo and his assistants received final payment for the painting in 1484.1 Yet the meaning has never been properly explained, and that is the purpose of this essay. The correct title should be The Virgin of the Immaculate Conception. The theological concept of the Immaculate Conception remains unclear to most Christians, including Roman Catholics. Simply, it pertains to the conception of Mary, not Jesus, at the point where she entered the womb of her mother, St. Anne. At the precise moment when she came into existence, Mary was “filled with the Holy Ghost.” This means, among other things, that she was never tainted with the original sin. The Virgin of the Rocks, to use its normal title, hangs in the Grand Galerie of the Louvre, in Paris, having been in the French Royal collection for most of its existence. The painting is dark, partly obscured by age, and is behind what I think is plexiglass, so it cannot be perfectly seen. A second version of the painting, with some changes, is in the National Gallery in London. However, much of the London example appears to have been executed by Leonardo’s assistants, and is not as effective in a number of ways.2 Both paintings were originally on wooden panels, but the Louvre painting was transferred to canvas in the 19th century. The 1483 painting is a wonderfully moving work of art, with its delicate and beautiful figures set against dark and powerful rocks. The Virgin Mary dominates the center of the scene. A surprising feature is that her head turns toward the infant St. John the Baptist on her right, at whom she looks with tender affection, while holding him firmly with her right hand. John leans toward the infant Jesus in fervent prayer, who is on the picture’s left, at a slightly lower level, and is distinctly separate from his mother. Jesus looks intently at, and blesses the infant St. John. Jesus’s body is tucked in closely to that of an angel, who holds him with her left hand. The angel turns his/her head toward us, the spectator, and aggressively points at the infant St. John. A slight oddity, which might have some significance, is that St. John cannot be identified by his typical attributes, carrying, as a staff, a long, slender cross, and wearing a costume of animal fur. The figures do not have halos. This is a peculiarity of Leonardo’s manner, conspicuously evident in his Last Supper. Like the deities in the art of ancient Greece, the divine figures all conform to an ideal of human beauty which would be universal in the western world. In the immediate foreground is a ledge which is probably the edge of a pool. Behind the figures, enclosing them as in a niche, are the fantastic rocks which have given the picture its name. They correspond to no normal geological formation, but are partly architectural, forming a strange openwork, broken through by an ominous and suggestive opening leading to a landscape which appears as the ancient earth might have, before it fully cooled. I like to think that the setting portrays the immaculate though unkempt world in the days of creation before sin; even before Eden, sin’s staging platform. In the context of religious paintings of 15th century Europe this would have been an extremely radical work both for its general effect, and for the arrangement of the holy persons. Perhaps because of this lack of conformity, the meaning of the painting has never been properly understood. Yet the pointing hand of the angel alone should signal us of the works didactic intent. Considering the original purpose of the painting, an altarpiece commemorating the Immaculate Conception of Mary, the emphasis on John in this context should have been more thoroughly explored. However, like all great paintings, the Virgin of the Rocks has never needed a correct interpretation to affect us profoundly. Still, the meaning adds a particular resonance to the forms. Contemplating the ramifications of conception, Immaculate or otherwise, must have provoked strong personal reactions in the artist, which caused him to present the subject with an extraordinary expressive power. The style of the work requires special consideration, though it is not the subject of this essay. The forms are painted in Leonardo’s soft manner, quite different from the harder edged, linear forms characteristic of fifteenth century art. And throughout the work, but particularly in the body of the Christ child and in the background rocks, he introduced an extensive modeling with shadows which achieves a greater illusion of physical mass. The resulting realism of effect may be what the original contract meant when it required that the work be done in oil in the “Greek or modern style.” The artist then toned the entire picture down to a general darkness, darker than any art of the time, probably to unify the entire picture surface with the dark modeling of the forms. It should be self-evident that the subject matter of the Virgin of the Rocks has to do with the theology of the Immaculate Conception of Mary. Surviving documents indicate Leonardo’s painting was the central panel of an altarpiece dedicated to the Immaculate Conception. The altarpiece was commissioned by a group of Franciscans who called themselves the Confraternity (Brotherhood) of the Immaculate Conception, for their chapel in the Church of San Francesco Grande in Milan. This Franciscan Confraternity had been formed specifically to combat the opposition of the Dominican Order to the Immaculate Conception, a controversy which remained an issue in the Roman Church until 1854.3 In 1480 the confraternity first commissioned an elaborate wooden altarpiece structure to enframe paintings, from an artist named Giacomo del Maino. This commission was to celebrate the fact that an Office for the feast of the Immaculate Conception, written by one of their members, Bernardino de’ Busti, had been accepted by Pope Sixtus IV. It was to be a large, gilded structure, framing an arched central panel, with smaller flanking side panels. (Such altarpieces were designed to suggest the cross section of a church, with central nave and side aisles.) This structure was unfinished when Leonardo, who had just arrived in Milan from Florence, received the commission to complete the project with paintings, along with two Milanese artists, the half-brothers Ambrogio and Evangelista de’ Predis. The contract still exists. It is dated April 25, 1483. From the contract we know the work was to include gilding and painting the wooden framework. The central panel was to include an image of the Virgin Mary with Old Testament prophets, presumably those associated with the theology of the Immaculate Conception. In the side wings were to be two paintings of four musical angels. When completed, the payment for the central panel was to be determined by a committee of the Confraternity. The contract required that it be finished by the feast of the Immaculate Conception on December 8 in 1483. The committee of the Confraternity assigned to judge the work must have included Bernadino dei Busti, whose office of the feast of the Immaculate Conception the altarpiece was to celebrate. In 1483 the Confraternity had one more cause to celebrate. On September 4, Pope Sixtus IV had published a “constitution” in which he accepted the validity of a feast of the Immaculate Conception, and would punish with excommunication for heresy all those who opposed the doctrine. This was the single most important event in the evolution of the doctrine of the Immaculate Conception, and was cited in 1854, when it finally became the official dogma of the Catholic Church. (See “Immaculate Conception” in the online edition of the Catholic Encyclopedia.) Possibly around this time the contract was changed, and the December 8 deadline pushed forward. I believe this was to allow an opportunity for the artist to develop a subject more in accord with the purposes of the Confraternity. The final subject was related to a traditional argument in defense of the Immaculate Conception. This argument focused on what could be called the theological relationship which exists between John the Baptist and the Virgin Mary. There is every reason to believe that Bernardino dei Busti, the Confraternity’s resident authority, advised the artist in the creation of this new subject matter. However, I also like to think that Leonardo himself may have wished to invent a new kind of iconography for the Immaculate Conception. Inventing was his was of doing art. Most of his portrayals of Christian subjects departed radically from traditional representations. The Confraternity would certainly have wanted the main altarpiece in their chapel to be a conspicuous presentation of the theme of the Immaculate Conception. It is difficult to believe that Leonardo would have painted, and that they would have accepted, a painting of a different subject. I visualize Leonardo discussing the subject matter with Bernardino dei Busti, the theological expert in the field, who, as I suggested above, was probably a key member of the committee assigned to judge the work. Leonardo would have required advice to arrive at the argument being made by the radical arrangement of the sacred figures, a departure from traditional ways of representing the Immaculate Conception in art. Particularly unusual in any painting of the Holy Family, is the emphasis accorded to St. John rather than to the Virgin Mary or to Jesus. The way the person of the Christ child has been diminished in the composition, to give emphatic prominence to the infant John the Baptist, violates established rules in the arrangement of sacred figures in a painting of a Christian theme. Jesus is located on the painting’s inferior left, rather than on its superior center or right hand side. (In Christian subject matter, it is the paintings left and right, and not the observer’s orientation, which is considered.) Leonardo, being Leonardo, “invented,” to use his term, an entirely new variation of the subject of the Madonna and Child. His purpose, and that of his patrons, was to realize, as explicitly as possible, the theology of the Immaculate Conception. The general effect of the work was as radical as its subject matter. While the theme of the Virgin at a grotto is a traditional one in the history of art, (for example, Mantegna’s painting of the subject, illustrated in the Wikipedia), the shear intensity of the setting of ominous rocks was unprecedented in effect, and the overall darkness and gloom of the scene would have violated a tradition of portraying sacred subjects in bright, strong colors. A definite interpretation of the Virgin of the Rocks does not appear in any of the Leonardo literature. There is a logical reason for this which I will address below. Yet I believe Leonardo made the meaning plain and obvious for anyone who carefully considered the conspicuous clues the provided by the artist. The most common explanation of the subject matter is that it illustrates a legend that the Holy Family encountered the infant St. John the Baptist in the wilderness during the return from the Flight into Egypt. This, in spite of the fact that this does not take into account the strange and salient features of the work, which were contrived to point clearly to the fact that the subject has to do with the theme of the Immaculate Conception of Mary. The documents and the internal evidence associated with this painting should make that clear. When, many years ago, I explained my interpretation of the Virgin of the Rocks to the great art historian Irwin Panofsky, that the subject is an allegory of the Immaculate Conception, he agreed entirely, and expressed surprise that neither he, nor anyone else, had ever thought of it. The keys to the meaning were provided in no uncertain terms by the artist, in the emphasis placed on St. John the Baptist by the pointing angel, and by John’s close physical relationship to the Virgin Mary. An intimate relationship between Mary and John pertains first of all to the fact that both served, in their own ways, as precursors of Jesus. More important for this painting, they were also related by being the only two mortals besides Jesus, to have been born cleansed of the original sin. But only the story of John appears in the Bible. The story of Mary’s origins do not. In the Gospel of St. Luke we learn about John being free of the original sin in his mother’s womb. The angel Gabriel announced to John’s father Zacharias, that his wife, Elizabeth, would bear a son “filled with the Holy Ghost, even in his mother’s womb.” (Luke, 1:15) We only learn about Mary’s parents, Anna and Joachim in an apocryphal text, the 2nd century Protoevangelium of James. This text became almost equivalent to the Bible itself, particularly in the history of art. The story of Mary in the Protoevangelium became embedded in Christian legend and was a favorite subject of artists during the later Middle Ages and the Renaissance. It is probably in the story of the origins of John in the Gospel of St. Luke that the whole idea of the Immaculate Conception of Mary originated, because John was immaculately born, so to speak, and it became the basis for a principle argument for the Immaculate Conception of Mary. This was at a time in Church history when arguments pro and con, between the Franciscan “Immaculists” and the Dominican “Maculists,” were being heatedly debated. So the angel aggressively points at the infant St. John, directing our attention, in no uncertain terms, to his major role in the work The Christ child looks intently at, and blesses John. Mary holds on to John, not to her son, and looks at him with motherly affection. The artist conveys what Mary and John share in common in warm emotional terms. On the other hand, a distinct space separates Mary from Jesus. Mary holds the outspread fingers of her hand above his head in a powerful gesture, designating a pregnant void which might refer to the immaterial nature of his birth. The wholly divine angel holds onto the wholly divine Son of God. This probably is the angel Gabriel, who, in three annunciations, first told Joachim, the father of Mary, then Zacharias, the father of John, and, finally, Mary, the mother of Jesus, that they were to have divinely appointed sons. The critical importance of John is even underscored by the fact that John is on the picture’s superior right side, while Jesus is on its less important left. Leonardo makes it unavoidably clear that the whole meaning of the work pertains to the infant St. John. The argument goes like this. We have hard evidence in Luke that John was free of the original sin in his mother’s womb. We don’t know about Mary from the bible, but the argument goes that she also had to be free of this original sin being the Mother of God. In fact Mary’s position as Mother of God required that she be John’s superior, even in the issue of immaculateness. Her necessary superiority to John in the degree of immaculateness is the foundation for the argument for Mary’s Immaculate Conception. In these theological issues, hierarchy is everything. If John were free of the original sin in his mother’s womb, Mary, the ultimate Virgin, had to be free of it at some earlier point, to be superior to John. That clearly definable point was at the point of conception itself. It was concluded that she could never have been contaminated at all by the sin of Adam. So it was established that John, at conception, was contaminated by the original sin, but was freed of it only six months later in the womb during the visit of Mary with her cousin Elizabeth, when Elizabeth was six months pregnant. (The “Visitation.”) Mary, recently pregnant with Jesus, heard from the angel that her cousin Elizabeth was also pregnant and went to see her. When they greeted each other in Elizabeth’s house, John leaped in his mother’s womb in recognition of Jesus in the pregnant Mary. It was only at that point, the theology goes, that John was freed from original sin. This argument based on John was first made, on record, by Osbert of Clare, prior of Westminster, in 1129, in his successful attempt to introduce the Feast of the Immaculate Conception in London. (d’Ancona, p.8) Why was this argument revived by Leonardo and his patrons? It has to be understood in the context of the ongoing theological dispute, with back and forth arguments, occurring at the time between the Franciscans and the Dominicans. Those opposed to the Immaculate Conception also emphasized the origins of John the Baptist and Mary, arguing that Mary and John were equivalent in their degree of freedom from the original sin, both being sanctified in their mother’s respective wombs, but not that Mary was immaculate at the point of conception. “No” the members of the Confraternity would have argued; Mary, the Mother of God, has to be superior to John, and therefore never contaminated by the original sin. Contemplating Leonardo’s painting in their chapel, the Confraternity would have been reminded of this argument made by Osbert of Clare, and in the painting perhaps that superiority is suggested by the fact that she holds on to John, with the superiority of a mother to a child.4 However, outside of the Confraternity’s chapel, the emphasis on John could have played the other way as well. This could account for the fact that, in the one major change in the second version, the angel no longer calls our attention to John. Also, by the early 16th century when the second version of the Virgin of the Rocks was being executed, it was considered no longer appropriate to defend the Immaculate Conception. It was a subject beyond defense. It would be inherently wrong even to suggest that it might need to be defended. The position of the Church was that it had been self-evident from Old Testament times. In art the Immaculate Conception came to be represented by a symbolic rather than by a didactic image, with the Virgin Mary floating in heaven on a half moon, surrounded by musical angels. This may explain why my interpretation was never sought in Leonardo’s painting by later observers, in spite of all the evidence in the record that the original commission required a painting commemorating the Immaculate Conception. I believe, and it is only speculation, that when the first Virgin of the Rocks was removed from the Confraternity’s chapel, and Leonardo was required to replace it, reluctant to simply copy his own work as he later had to do, he experimented with a new composition in a number of drawings, and in the two famous representations of the strange image of the Virgin Mary seated on the lap of her mother St. Anne. Mirella d’Ancona observes that, in art, this subject always refers to the Immaculate Conception. (d’Ancona, p.39) [Wikipedia illustrations under Leonardo da Vinci.] The best known example before Leonardo is Masaccio’s painting, the Madonna and Child with St. Anne, in the Uffizi Gallery in Florence. (Wikipedia, Masaccio.) It would have been a strange coincidence if Leonardo had taken up once more this unusual subject for some patron other than the Confraternity in Milan. However, the large drawing of the Virgin on the lap of St. Anne in the National Gallery in London, and the similar painting in the Louvre, probably were both executed too late in the artist’s career to have been intended to satisfy the Confraternity’s original commission. We do know from documents that Leonardo returned to this theme in drawings shortly after his return to Florence in 1499. The famous drawing in the National Gallery in London which represents the Virgin, her mother St. Anne, the infant Jesus and now, one more time, the infant St. John is another inventive variant on the theme of the Immaculate Conception, again with no precedents in Christian art. The infant St. John normally does not appear in Immaculate Conception subjects where Mary is seated on her mother’s lap. Once again Leonardo was experimenting with Christian iconography. It is quite possible that, in the drawing, in the close relationship of St. Anne to the child St. John, we are to understand that St. Anne could also be St Elizabeth, the mother of John. There are many precedents in the art of the time, to give figures double identities to convey certain meanings. The artist is reminding us of the parallels that exist between the births of the two children of Anne/Elizabeth. And here the pointing hand appears again, now directing our attention overhead to heaven where both their children miraculously originated. The figures in the drawing are roughly the same size as those in the Virgin of the Rocks. Large drawings done on the same scale as an intended painting are technically known as “cartoons.” A letter survives, dated April 3,1501, which describes Leonardo in Florence, at work on a large cartoon of the Virgin, St. Anne, and the Christ Child, but without St. John. However, Giorgio Vasari, in his Life of Leonardo, describes another version done by Leonardo at this time in Florence, which does include St. John, though, in this rendering, St. John is playing with a lamb. Since Vasari was writing this many years later when all these works were out of sight, he may have confused the cartoon with the Louvre St. Anne and the Virgin, where Jesus is the one reaching for the lamb. Whether Vasari was describing the London cartoon or another of the same theme, is a matter of dispute.6 Whatever the case, a number of documents support the conclusion that Leonardo, shortly after his return to Florence in 1501, returned to the subject of the Immaculate Conception in the theme of the Virgin seated on the lap of her mother Anne, both with and without St. John, and he continued to work on it during a time when he was under pressure from the Confraternity to replace the central panel in their altarpiece. The fact that the painting was replaced in 1508 by what could be called a close copy, something Leonardo would normally never have done, seems to me to have been a fall back position, just to get closure in a project which had dragged on for many years. In the cartoon, with St. John in the picture and the three mothers fused into a single image, the treatment perhaps proved to be too radical. In his second version, the Virgin, St. Anne and the Christ Child in the Louvre, Leonardo returned to the more conventional arrangement of an Immaculate Conception theme, with Mary seated on her mothers lap, but leaving out John the Baptist. However, the motif of the infant Jesus reaching for a lamb is an original touch. I believe that this composition also grew out of the original project for the Confraternity of the Immaculate Conception in Milan, though the painting is generally dated 1510-13 on the basis of its style. In other words, after 1508, when the second Virgin of the Rocks was completed, and installed in the Confraternity’s altarpiece in San Francesco Grande. It is astonishing how much is made of this strange issue of Mary’s virginity and her Immaculate Conception. Schools and Colleges are named after the Immaculate Conception. Churches everywhere are dedicated to it, as is, more generally, the Roman Catholic Church in America. Such is the way of religion. The subject suggests many opportunities for feminist, psychological, and cultural interpretations, but I will leave those for a later generation of scholars, but with one further observation. There may be an association, psychological or otherwise, with Leonardo’s astonishing drawing studies of the anatomy of conception of a less immaculate sort. Cited by Pietro C. Marini, Leonardo da Vinci: the Complete Paintings, New York, 2003, p.125. 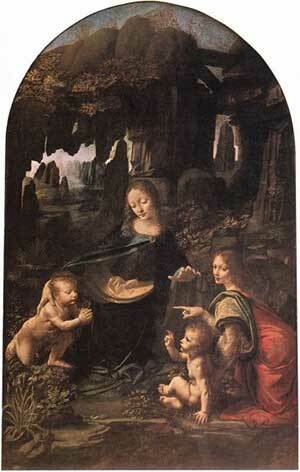 This is the most complete account I know of, of Leonardo’s two paintings of the Virgin of the Rocks. [2[ However, I agree with Kenneth Clark that Leonardo painted the one passage where major changes were made, the figure of the angel. The face is one of Leonardo’s most perfect achievements of idealized form, and the head is framed in Leonardo’s characteristic dense and curly hair. Mirella Levi d”Ancona, The Iconography of the ImmaculateConception in the Middle Ages and Early Renaissance, The College Art Association, New York, 1957, p. 73ff. This is one of the best accounts available, both of the history of the subject of the Immaculate Conception in art, as well of Leonardo da Vinci’s painting of the Virgin of the Rocks. However, she, like all commentators on the Virgin of the Rocks, does not believe the painting has anything to do with the Immaculate Conception. Probably because it is such a complete departure from the way this subject has been portrayed in art. The documents pertaining to the history of these paintings have been read in different ways by different people. A common opinion is that the Virgin of the Rocks was never installed in the altarpiece intended for it.While I have extended arguments in support of the history I report above, the defense of my position would require a separate essay. The fact that the identity of St. John was not made sharply clear, by the absence of his usual attributes, one of the oddities of the painting, may be an example of the argument being softened to the point where it would only be recognized by the members of the Confraternity, and perhaps by their Dominican opponents. The Pope, in his decree of 1483 supporting the Immaculate Conception, did not give any specific reasons, and required that arguments for it be played down. Further, that positions should not be taken by its supporters that did not conform to the teachings of the Church which, presumably, would be forthcoming. Leonardo da Vinci, Master Draftsman, Carmen C. Bambach, editor, The Metropolitan Museum of Art, New York, 2003 p.19.